On behalf of Bishop John R. Thompson, Sr., First Lady Jenice R. Thompson, John II, Justin, and the entire CTCC Family we would like to take this opportunity to say welcome! It is our prayer that the Grace of God will rest upon you and that he will strengthen you to face every challenge and each encounter as you live in the prophecy of your destiny and not by the dictates of your environment. May the peace of God be yours. 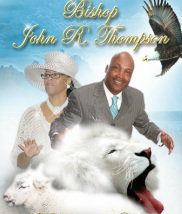 Bishop & 1st Lady J. R. Thompson,Sr. Silver 25th Church Anniversary Pictures! Click below to see more..
CLICK HERE TO SEE BISHOP'S ITINERARY! CLICK HERE TO SEE A LIST OF OUR MINISTRIES! Calvary Temple Christian Center, 2017. Unauthorized use and/or duplication of this material without express and written consent of this website’s author and/or owner is strictly prohibited. Excerpts and links may be used, provided that full and clear credit is given to Calvary Temple Christian Center with appropriate and specific direction to the original content.